So I’ve been toying with SharePoint 2013 in my lab at home, doing the install and configuration at the moment, setting up my first Site after the initial configuration but noticed that I made a typo in the Database name. 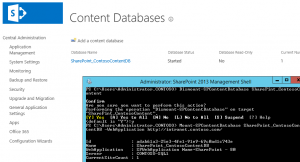 So how do I go about fixing or renaming that database in SharePoint and in SQL Server. Now the database is ready to rename. Open up SQL Management Studio and connect to your Database Server hosting SharePoint. Now usually when you go to rename a database you will get an error message stating that the database is in use. To get around that we turn our database into Single User mode, rename it and then set it back to multi user mode with the following SQL snippet. And there you have it, renaming a SharePoint content database if you make a typo like me.